ANGELS OF THE MEANWHILE IS OUT! No more placeholder cover mock-up, because Angels of the Meanwhile is now live! 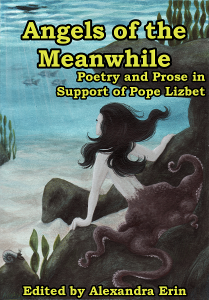 We’ve sent it off to the poets and authors, we’ve sent it off to the pre-orderers and donors, and we’ve found it a place to live on the web where any further sales can go directly to Pope Lizbet with no intermediaries. Check your inbox if you’re expecting a copy (and your spam folder if it’s not there). If you’re not… well, it’s not too late to help Elizabeth or to help yourself to phenomenal writing. Just follow the link! This entry was posted in Ongoing Project and tagged aotm, popelizbet makes things happen by Alexandra Erin. Bookmark the permalink.